* WINNER of the Sunglass Warehouse Giveaway * BuddyCO is Living the Life of Riley! I want to give a big and hearty CONGRATULATIONS to BuddyCO, the winner of the $20 Gift Certificate to the Sunglass Warehouse! BuddyCO now has 48 hours to confirm! Thanks so much to everyone who entered! This was my first giveaway and it was a great success! I owe it all to my AWESOME readers! There's plenty of great giveaways going on right now, so get those entries in! Good Luck! One Response to * WINNER of the Sunglass Warehouse Giveaway * BuddyCO is Living the Life of Riley! 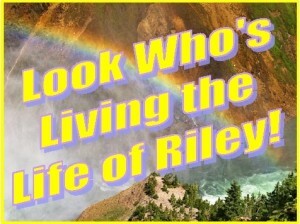 Pingback: Tweets that mention * WINNER of the Sunglass Warehouse Giveaway * BuddyCO is Living the Life of Riley!